AddressThe address for this sale in Phoenix, AZ 85050 will no longer be shown since it has already ended. All Items are Sold "AS IS"; No refunds. 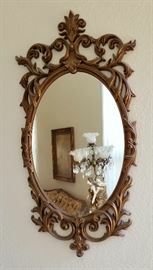 Gorgeous Oval Mirror. Very unusual. Beautiful Dining Table with 6 chairs. Can easily fit 8. Would be great with upholstered end chairs. Wonderful silverware in its' original case. 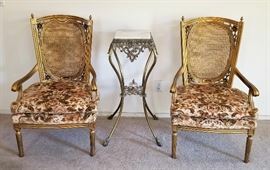 These would be wonderful as end host chairs for the dining table. European lamp with 3 ladies dancing. Made in Italy. Nice round end table great in any room. Made in Italy lamp with fabulous figures. Marble table top. Washer and dryer for sale. Great bedroom set. Can be purchased as a set or per piece. White metal bed. Great style making any small room look bigger and airy. 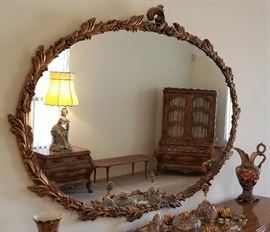 Elaborate dresser mirror and ceramics. Doors open on this dresser to reveal drawers. 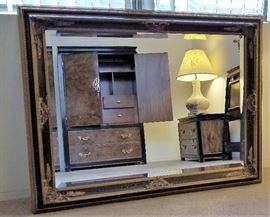 Beautiful dresser with mirror. Matching to the dresser these doors open to reveal drawers. Ashley very soft brown distressed look recliner. Look at this bed! Wow! This is so gorgeous in person. All the furniture is. You must see it in person to appreciate it. Great craftsmanship in these Italian lamps. The bedside tables are superb! Matching very unusual highboy dresser that matches the other bedroom furniture. See the other photo where it is shown open. Here is the dresser open. This is wonderful. Marble tabletops and Victorian sofa. Microwave for sale and kitchenwares. 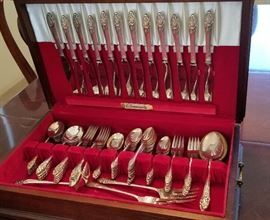 Another set of beautiful silverware with original wooden case. There are 2 of these pretty deep red chairs. Another unusual table in marble and metal. This can go in many places. Something different for an entryway ceiling light. Blue and white dining table. Great for kitchen or dining area. The chairs are neat!